1. A daily English exercise. You may opt to receive the exercise in text format included with your daily email, or you may visit the subscribers’ area to go through an interactive version of it, where you’ll get a score right after submitting your answers. 2. Access to the exercise archive, which contains more than 320 interactive exercises on a wide range of topics. Examples include punctuation, capitalization, subject-verb agreement, confused words, pronouns, redundancy, spelling, and much more. 3. Access to our writing courses. The first one available is about freelance writing online, and over time we’ll be adding new ones. 4. 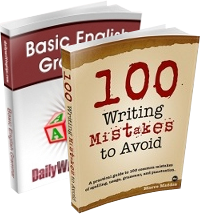 Access to three bonus ebooks, including 100 Writing Mistakes to Avoid, completely free of charge. Normally the Pro subscription costs $9.90 monthly or $79.90 yearly. For two days only–today and tomorrow–we’ll be offering the yearly subscription with a discount of 40%. 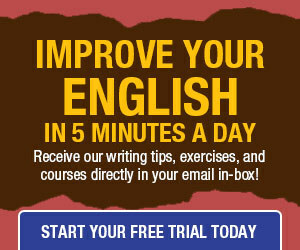 In other words, you’ll pay only $49 for a whole year of awesome writing tips and English exercises! This price is equivalent to just $4 per month. –> Click here to grab your discounted Pro subscription. Notice that this Black Friday offer comes with our regular 15-day free trial, so you can test everything out before making up your mind. What are you waiting for?